Fortunate that I was given the chance to get one of the Caring Cross for a review. I’m so happy that I will possess a Caring Cross knowing I’m a BIG fan of our Savior. The experienced during my Amazon transaction goes very well, and quick. I have already an account at the website so it’s easy for navigating and checkout. I received the item via USPS with a retail price of $7.98. 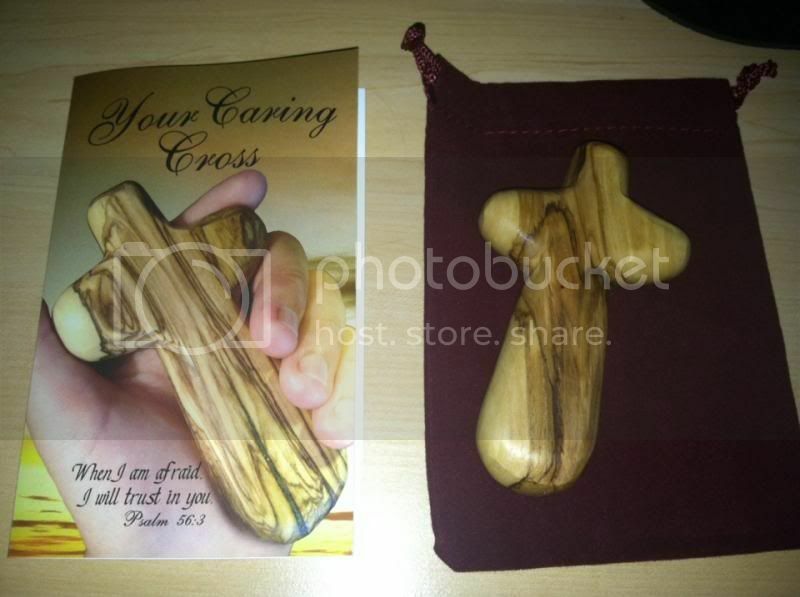 I received a Your Caring Cross, a booklet of Cross History, a Bag, and one Single Olive Wood Caring Cross. Caring Crosses are individually carved from a single unique piece of beautifully grained olive wood pruned from the olive trees around Bethlehem the birthplace of Jesus. Christians have been carving crosses like this for hundreds of years, originally for pilgrims and more recently tourists visiting the Holy Land. Each craftsman receives a fair price to support their family and Christian community. My Caring Crosses are designed to fit comfortably into the palm of your hand as an aid to prayer or meditation. Ideal as your spiritual companion for easing children's fears, comforting worries and stresses of adults and focusing the prayer of the sick and elderly. You will receive a unique Olive wood Cross from the Holy Land, a gift card and a authenticity card. All three of these items fit inside the Burgundy Velveteen Pouch and can be given as a gift. (1) The Christian Craftsman and his family in the Holy Land. (2) Your group or organization and the benefits both locally and globally that you do. (3) The recipient who has a spiritual companion for easing worries and fears. I admire how they carved the cross perfectly, very lightweight, I can bring it with me anywhere I go, and has a great bag where I can keep it safe. The olive wood being used is also great. The Cross is small that I can hold everything in my palm. The booklet has information about the Caring Cross and it is wonderful. I am very privileged and satisfied with the overall product. I can share it with my loved ones. 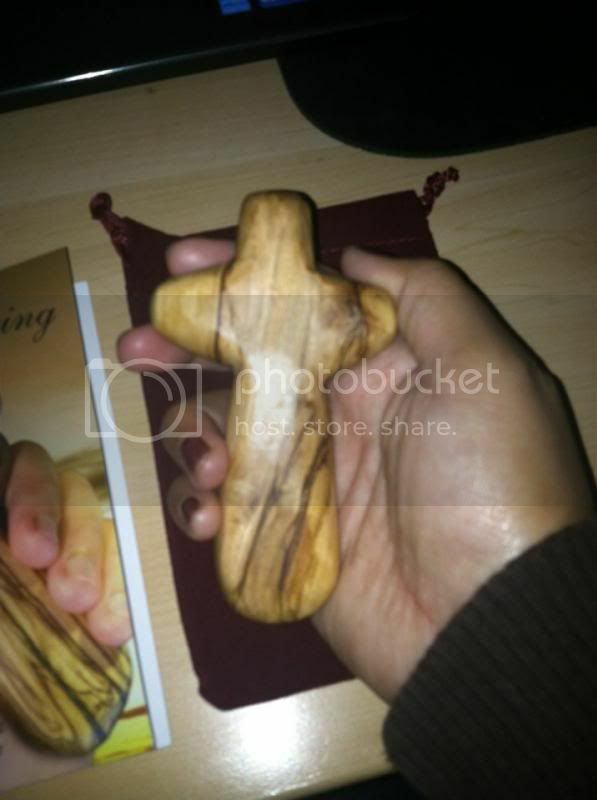 The Cross is an authentic handicraft made in Bethlehem from Holy Land olive wood. The only thing I need to do before I used this Cross is to let our parish priest bless the Cross so I can put it on my son’s bedroom. This is a perfect gift for your family members, friends, and people you care. Please purchase it through Amazon where I have my transaction. The craftsmanship is absolutely beautiful! Would make a great gift for any age! It must be very comforting having this on hand with a heart in faith and love. This is going to make the perfect gift for my mother for Christmas. I have never seen anything like this,so glad you shared. That is a beautiful cross! This is beautiful, I would want to have this myself. nicely crafted cross that Christians must have. I like to have one. I like the fact that, it helps local craftmen who made this. Indeed, noble. You must be one happy soul to have been the recipient of such! you must a great one to have this one. I am a member of INC and we dont have cross but I do wear one as a necklace and one for my daughter too. it gives me faith and catches me when I am in that lack of faith. It seems that there is almost nothing one cannot find on Amazon. It is nice that you were able to purchase something you enjoy so much. That looks like a nice product, Mommy! For religious people, it is a treasure. I'll be glad as you if I'm going to receive such lovely cross. This is indeed a great gift for someone. The cross reminds me of my grandfather, he was a great wood carver. He carved religious statues when he was still around. That is so nice mommy. I am sure this would make great gift too. It is well made and it has so much meaning. Looks very handy. They sure have unique curving. It fits good in your grip. It is very ergonomic. we don't believe on this kind of religious artifacts but it looks well handcrafted though. (don't want to give further comment on this).